You will be given a reference e-book to read which has 686 pages And the test will be based on that e-book , you can take final test within 1 year of purchase. Human resource (HR) management refers to the process of managing the human resources or workforce of an organization. The process is responsible in attracting, selecting, training, assessing and rewarding the organizational staff and overseeing leadership and culture within the organization. All organizations also make it a point to carry out the human resource management process in compliance to the labor and employment laws within their individual states. In any instance when the majority of the employees of an organization desire to carry out a collective bargain agreement, the HR department will have to serve as the primary liaison of the company and talk to the representatives of the employees. The concept of human resource management is said to have started in the earlier years of the 20th century. It started when some researchers started to document techniques in establishing business value by strategically managing the workforce. The entire process was actually ruled by transactional work first including benefits and payroll administration. But after some time, different factors such as globalization, technological advancement, company consolidation and comprehensive research caused the HR departments of different organizations to focus more on other strategic initiatives including talent management, labor and industrial relations, succession planning, talent management, diversity and inclusion and mergers and acquisitions. Experts also define human resource management as an organizational function which focuses on recruiting, managing and directing people towards a common goal. This is something that you will learn by taking up a human resource management certification course. You can also expect HRM to deal with issues that relate to people including hiring, organization development, performance management, compensation, wellness, safety, administration, communication, employee motivation, training and benefits. 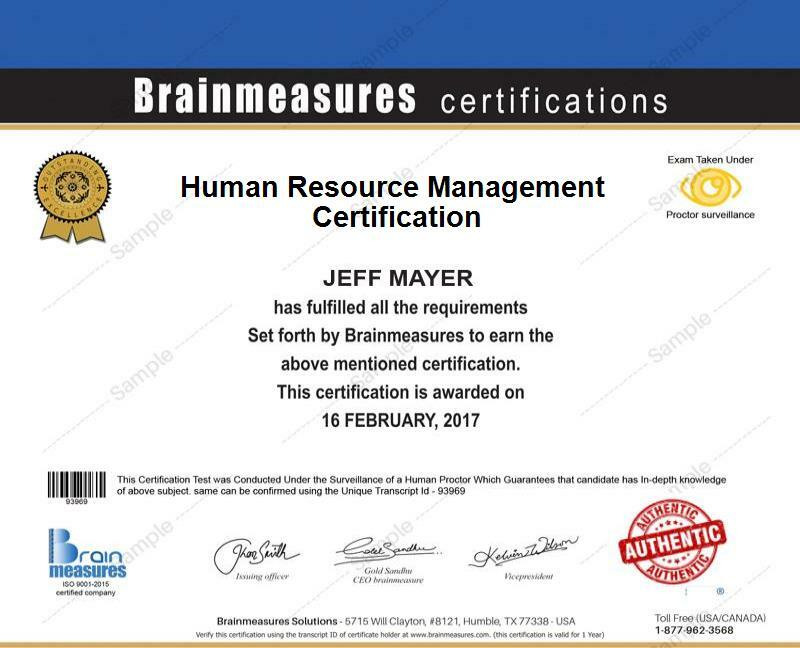 You will never find it hard to learn everything about HRM if you take part in the human resource management certification program from Brainmeasures. From the moment it was established, Brainmeasures, as a legitimate and reputable online certification company, continues to satisfy practitioners of different fields with its highly comprehensive training and accurate learning system. It continues to work based on ISO so getting the kind of learning experience that you wish to generate is greatly possible. All that you have to do to get your skill certification is to be serious in completing the human resource management course from Brainmeasures and pass the online exam related to the certification course. The human resource management certification program is proven to be beneficial to professionals who aim to manage people. What makes the process of enrolling in this specific program from Brainmeasures desirable is that you will never be bothered by any qualifications or requirements. You can take part in the program anytime if you are an aspiring human resource manager, someone who wishes to become part of the human resource department of an organization or a professional who needs to improve skills and knowledge in human resource or personnel management, planning, problem solving, labor relations and organizational change and development management. It should also be noted that human resource management certification holders can receive a more desirable compensation. If you are already a certified human resource management expert, you can expect your annual salary to start to range from $43,000 to $141,000.